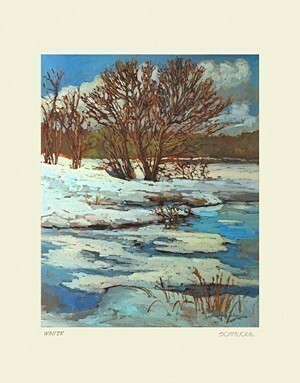 Our friend and artist Jan Schmuckal creates original oil paintings that simply take your breath away. Printed on Hannemugle rag paper with archival lightfast ink. Presented in acid free mat and foam core, and hand signed by the artist. Jan states, "The changing light of day and the moods it evokes are the foundation of all my oil paintings. My painting style is derived from the Tonalist Movement, which was started in the US and practiced by American artists while the Impressionists were painting in France, in the decades surrounding 1900." We at Dard Hunter Studios feel that this collection of giclee prints captures the unique beauty that lives in every one of Jan's creations, and we are proud to offer her work here for your consideration.... AND NEW FROM DARD HUNTER: We are proud to introduce our exclusive new frame profile, aptly named "Century" - as it is built to last, and is sure to be a treasured family heirloom. Constructed of 3" wide slightly beveled quarter sawn white oak molding, with elegant beading around the perimeter of the frame. Pictured here framing an 8" x 10" matted print, to show off its generous proportions.